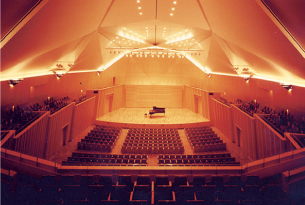 The Kirishima International Concert Hall (nicknamed “Miyama Conseru”) is located amidst lush nature. 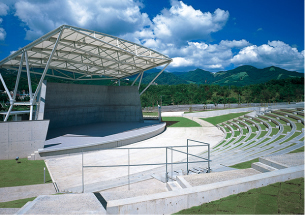 Opened in July 1994, this music facility, together with the Kirishima Open Air Museum, is part of the Kagoshima prefecture’s vision to develop the Kirishima region into a culture zone. Special shuttle buses will be available on days where concerts are held (advanced reservation required). 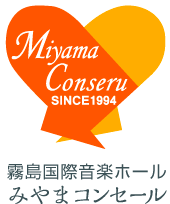 Kindly contact Iwasaki Bus Network two days prior to concert. This hall was designed and built to achieve optimal amplification and reverberation for classical music, in particular chamber music. The hull-shaped ceiling and leaf-shaped surface create rich, three dimensional listening experiences. With a total of 770 seats (1F: 518 seats, 2F: 252 seats) arranged in a spacious and comfortable manner, the hall provides an ideal environment for the appreciation of fine music. The seats on the second floor are arranged on a balcony that surrounds the hall, merging the audience seats and the stage into one. There is also a designated barrier-free zone as well as a “parent-children” room for those bringing young children. Besides chamber and other classical music performances, this versatile hall can also be utilised for public lectures, symposiums and other activities. This arena, with a seating capacity of about 4,000, can be utilised for a wide range of music activities, such as traditional arts performances, new age music, jazz, and popular music concerts, etc. 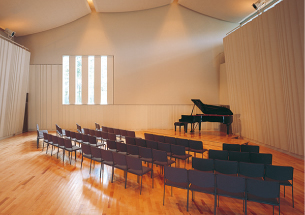 The small hall (Capacity: 200) and rehearsal room (Capacity: 40) are readily available to students and musicians for holding small recitals and rehearsals. The chairs and tables in these rooms can be freely arranged, making it possible to hold various kinds of gatherings here besides recitals and rehearsals. The foyer, with its full glass panels, offers a spectacular view of the great natural surroundings including the Kirishima mountain range. There is a cafeteria located at a corner of the foyer, where one can enjoy great scenery over light refreshments.